The 2008–09 NHL season was the 92nd season of operation (91st season of play) of the National Hockey League (NHL). It was the first season since prior to the 2004–05 lockout in which every team played each other at least once during the season, following three seasons where teams only played against two divisions in the other conference (one division at home and one on the road). It began on October 4, with the regular season ending on April 12. 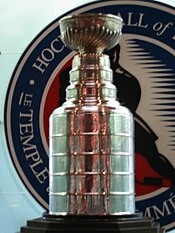 The Stanley Cup playoffs ended on June 12, with the Pittsburgh Penguins taking the championship. The Montreal Canadiens hosted the 57th NHL All-Star Game at the Bell Centre on January 25, 2009, as part of the Canadiens' 100th season celebration. National Hockey League announced that the regular season salary cap would be going up for the fourth straight season. The 2008–09 salary cap is being increased by $6,400,000 (US) per team to bring the salary cap up to $56,700,000 (US). The salary floor is at $40,700,000 (US), which is higher than the salary cap on 2005–06 season. The NHL brought in a number of rule changes for the start of the 2008–09 NHL season aimed at increasing offence and safety. The first rule change was to Rule 76.2 on faceoffs. The first faceoff of a power play will now be in the defending zone of the team that committed the foul, regardless of where the play was stopped. The second rule dealt with the issue of safety while players are pursuing the puck on a potential icing call. Rule 81.1 states that, "Any contact between opposing players while pursuing the puck on an icing must be for the sole purpose of playing the puck and not for eliminating the opponent from playing the puck. Unnecessary or dangerous contact could result in penalties being assessed to the offending player." The third rule change also dealt with faceoff position: if a puck is shot off the goal frame, goal post or crossbar, the subsequent faceoff will remain in the end zone where the puck went out of play. Another rule change prohibits TV commercials, game breaks, and any line changes immediately after an icing call. The 2008–09 schedule returns to the pre-lockout schedule. The new schedule eliminates the three-year rotation where teams would only play teams in two of the three divisions of the opposite conference; instead the new schedule guarantees that each team plays every other team at least once. In this new schedule, each team will play their divisional rivals six times for a total of 24 games; they will play all other conference teams four times for a total of 40 games, and will play every team in the opposite conference at least once for a total of 15 games. To obtain a total of 82 games there are an additional three-wild card games; for the Canadian teams, the three-wild card games are composed of playing the three Canadian teams in the opposite conference an additional time. The regular season started with four games played in Europe. The Ottawa Senators and the Pittsburgh Penguins played each other twice in Stockholm, Sweden with the two teams splitting a 2-game premiere, and the New York Rangers and the Tampa Bay Lightning played each other twice in Prague, Czech Republic The Rangers swept Tampa Bay 2–0. The New York Rangers represented the NHL in the inaugural Victoria Cup challenge game as part of the club's pre-season schedule. The four teams also played some pre-season exhibition games in Europe. Other than the four overseas regular season games starting October 4, October 9 was the actual first day of regular season games as far as widespread continental North American broadcast from most providers, including pay per view hockey packages. Other teams still played preseason games between October 4 and 6. By February 23, 2009, all four teams who started the season in Europe had fired their coaches. Because of the success of the 2008 Winter Classic, another outdoor game was held in the 2008–09 NHL season. While Yankee Stadium was considered an early favorite, in a game to be hosted by the Rangers, cold-weather issues involving the old stadium put that location out of the mix. Another site considered was Beaver Stadium at Penn State University, with that game to likely involve the Penguins and the Flyers. On May 29, 2008, TSN reported that the 2009 NHL Winter Classic would be held in Chicago, Illinois on January 1, 2009, played between the Chicago Blackhawks and defending champion Detroit Red Wings. Soldier Field was considered an early candidate, however the NFL's Chicago Bears objected, citing a possible home game for the 2008 NFL playoffs that weekend (January 3–4); ironically, the Bears ended up being eliminated from contention in the last week. It was decided that the game would be played at Wrigley Field, the North Side home of the Chicago Cubs, as confirmed by the Minneapolis Star-Tribune on July 6. Ten days afterward, the NHL confirmed the reports that the game would officially be held on New Year's Day. Faceoff was scheduled for 1 pm EST (12 noon CST). The Red Wings won the game 6–4. The NHL and National Hockey League Players' Association (NHLPA) agreed to move the trade deadline from Tuesday, March 3, 2009, to Wednesday, March 4, 2009. This was done mainly because the schedule has twelve games on March 3 and only two on March 4. At the meeting, held in Naples, Florida from March 9–11, 2009, general managers of the teams discussed issues that concerned them. Consensus on any topic would lead to action by the Board of Governors or the Competition committee in later meetings. Paul Kelly, president of the NHLPA, made a presentation on the topic of dangerous hits to the head, proposing new rules to penalize intentional hits. The general managers could not agree on the planned rule change and took no further action. Kelly intends to review the issue at the future Competition committee meeting, which is held after the Stanley Cup final. The general managers also discussed the topic of fighting in hockey, and agreed to penalize further players who start fights directly after face-offs and to further enforce the existing 'instigator' rule. The managers agreed to award a second-round compensatory pick in the 2009 entry draft to the New York Rangers due to the death of Alexei Cherepanov. The Christmas holiday roster freeze went into effect on December 19, 2008, and ended on December 27, 2008. The NHL Winter Classic was held on January 1, 2009, between the Detroit Red Wings and the Chicago Blackhawks at Wrigley Field. No regular-season games were held during the NHL All-Star break from January 22 to January 26. During the break, the NHL held its annual All-Star Game and the SuperSkills Competition in Montreal, Quebec. The trade deadline was March 4 at 3 pm EST. The most notable trade was between the Phoenix Coyotes and Calgary Flames sending Olli Jokinen to Calgary, but there were fewer trades than at previous deadlines. The first goal of the season was scored by Markus Naslund of the New York Rangers in Prague against the Tampa Bay Lightning. On October 16, 2008, the Blackhawks fired head coach Denis Savard and replaced him with former Colorado Avalanche and St. Louis Blues head coach Joel Quenneville. On Saturday, October 25, the NHL scheduled fifteen games—with all 30 teams playing—for the second time in league history. On November 3, 2008, in a game between the Columbus Blue Jackets and the New York Islanders, Islanders forward Chris Campoli scored twice in one overtime. First, Campoli retrieved a loose puck and fired a shot past Jacket's goaltender Fredrik Norrena. The shot went through the net and, while Campoli celebrated, the game continued. Campoli then received a pass in front of the goal and shot the puck again into the net. Tampa Bay Lightning head coach Barry Melrose would record his first win as a head coach in over 13 years on October 21, 2008, with a 3–2 victory over the Atlanta Thrashers. However, the Lightning did not get off to a great start as hoped, and Melrose was fired by the Lightning with a 5–7–4 record. Rick Tocchet, who had been hired as assistant coach during the previous offseason, was promoted to interim head coach. Melrose subsequently re-signed with broadcaster ESPN. Melrose proceeded to get into a war of words with the Lightning management, accusing the management of interference during an interview on a Toronto radio station. On December 2, 2008, Carolina Hurricanes' head coach Peter Laviolette was fired and Paul Maurice was rehired in his place. Ron Francis became the team's associate head coach. During the annual December board of governors' meeting, the issue of the state of the economy was raised. The Phoenix Coyotes were reported to lose up to $35 million on the 2008–09 season. Asked to comment on Phoenix's loss, Commissioner Gary Bettman was quoted as saying "They're going to get through the season just fine." The Buffalo Sabres, while not for sale, had been approached for purchase. On December 5, Sean Avery of the Dallas Stars was suspended six games for 'off-colour' remarks prior to a game against the Calgary Flames. On December 14, the Stars' management announced that he would not be returning to the team. After Avery's reinstatement by the league, he reported to the Hartford Wolf Pack of the AHL. He was placed on re-entry waivers and was claimed by the New York Rangers, his team in 2007–08. On December 23, the Toronto Globe and Mail reported that the Phoenix Coyotes team is receiving financial assistance from the league in the form of advances on league revenues. The Coyotes have pledged all of their assets to New York company SOF Investments LP to cover an estimated debt of $80 million. The team has lost an estimated $200 million since 2001 and may lose $30 million this season. One of the team's owners, Jerry Moyes' principal source of revenue, Swift Transportation is also in financial difficulty. ESPN reported that the league has gotten involved with the operations of the Coyotes and their revenues. The NHL reportedly wants to work with the city of Glendale, Arizona, which owns the arena and receives revenues from the team. ESPN also reported that Moyes wants to sell his share of the team and that Hollywood film producer Jerry Bruckheimer is a possible interested purchaser. In February 2009, three head coaches were relieved from their duties. On February 1, Craig Hartsburg was fired as head coach of the Ottawa Senators following a 17–24–7 start to the season and was immediately replaced by Binghamton Senators head coach Cory Clouston. On February 15, Dan Bylsma of the American Hockey League's Wilkes-Barre/Scranton Penguins was promoted to replace Michel Therrien of the Pittsburgh Penguins as interim head coach. Bylsma would later be announced as a permanent head coach of the team. On February 23, the New York Rangers fired Tom Renney following an overtime loss and he was replaced on the same day by TSN analyst and former Tampa Bay Lightning head coach, John Tortorella. In March, goaltender Martin Brodeur returned to the New Jersey Devils after a long injury. He became the winningest goaltender in league history, surpassing the record of Patrick Roy. Guy Carbonneau was also fired as the head coach of the Canadiens when the team was in danger of being eliminated from the playoffs. In April, the Columbus Blue Jackets qualified for the playoffs for the first time in franchise history. The Carolina Hurricanes qualified for the playoffs for the first time since their 2006 Stanley Cup victory. The Ottawa Senators missed the playoffs for the first time since the 1995–96 season. In an ironic twist, considering his injury woes of past seasons, Jordan Leopold played in all 64 games for the Colorado Avalanche. Upon being traded to the Calgary Flames Leopold played in all 19 remaining games for the Flames becoming the only NHL player to play 83 games of the 82 game 2008–2009 season. Jacques Lemaire resigned as the first head coach of the Minnesota Wild on April 11 after missing the playoffs. Scoring in the regular season improved somewhat from 2007–08, with an average of 5.7 goals scored per game (7,006 goals scored over 1,230 games). Goaltenders combined for 156 shutouts. In May 2009, it was revealed that the NHL had taken control of the Phoenix Coyotes from the start of the season and had known of the financial difficulties of the team prior to the start of the 2008–09 season. After owner Jerry Moyes petitioned the club into bankruptcy against the league's wishes, so as to sell the team to Jim Balsillie who plans to move the team to Hamilton, Ontario, the league challenged the right of Moyes to file for bankruptcy. In the documents filed with the Phoenix bankruptcy court, the NHL stated that the league took official control of the team on November 14, 2008. The league then began advancing money to the club from league revenues, and made a loan to the club in February 2009, for a combined estimated total of $44.5 million over the full season. During the season, commissioner Bettman and deputy commissioner Bill Daly had made a series of denials and obfuscations, while firing the Coyotes CEO and laying off 18 Coyotes employees. Moyes' documents filed with the court indicated that the team had lost $73 million over the last three years, and that the projected loss was $45 million for 2008–09. Jacques Martin became the head coach of the Montreal Canadiens on June 1 when former coach Bob Gainey returned to his general manager status. On June 3, Tony Granato was fired as the head coach of the Colorado Avalanche and was replaced on the next day by Joe Sacco, head coach of the Avs' top minor league affiliate the Lake Erie Monsters of the AHL. On June 9, despite Brent Sutter winning 51 games (a franchise record), he resigned as head coach of the New Jersey Devils after two first-round playoff losses because of family reasons. One day later on June 10, Dave Tippett was fired as head coach of the Dallas Stars after missing the playoffs for the first time since the 2001–02 season, when Rick Wilson took over as coach. Marc Crawford was named the new head coach for the 2009–10 season the next day. Todd Richards would be named the second head coach of the Minnesota Wild on June 15, three days after the Pittsburgh Penguins won the Stanley Cup over the Detroit Red Wings 4 games to 3. Evgeni Malkin earned the Conn Smythe Trophy for becoming the most valuable player during the Stanley Cup Finals. GP = Games Played, W = Wins, L = Losses, OTL = Overtime/Shootout Losses, GF = Goals For, GA = Goals Against, Pts = Points. After the regular season, the standard of 16 teams qualified for the playoffs. The San Jose Sharks won the Presidents' Trophy for having the best record in the league, at 117 points. Division champions maintain their relative ranking during the entire playoffs while the remaining teams get reseeded below them after each round. *Montreal finished with exactly the same record as the Florida Panthers (including the first tie-breaker – number of wins). Montreal won on the second tie-breaker, head-to-head record, with a six points to three advantage in the four-game season series. In each round, the highest remaining seed in each conference is matched against the lowest remaining seed. The higher-seeded team is awarded home ice advantage. In the Stanley Cup Finals, home ice is determined based on regular season points. Each best-of-seven series follows a 2–2–1–1–1 format: the higher-seeded team will play at home for games 1 and 2 (plus 5 and 7 if necessary), and the lower-seeded team will be at home for game 3, 4 and 6 (if necessary). February 14, 2009 – Mike Green, defenseman with the Washington Capitals, scored in eight consecutive games to set a new NHL record for a defenseman. March 12, 2009 – Henrik Lundqvist, goaltender with the New York Rangers, became the first goaltender in NHL history to win 30 games in each of his first four seasons. March 17, 2009 – Martin Brodeur, goaltender with the New Jersey Devils, won his 552nd game, surpassing Patrick Roy for the all-time wins record. April 8, 2009 – Curtis Joseph, goaltender with the Toronto Maple Leafs, lost his 352nd game, tying Gump Worsley for most losses by a goaltender. June 12, 2009 – Sidney Crosby became the youngest captain in NHL history to win the Stanley Cup. June 12, 2009 – Evgeni Malkin became the first Russian player in NHL history to win the Conn Smythe Trophy. Radek Bonk Nashville Predators 2-time NHL All-Star. Philippe Boucher Pittsburgh Penguins 1-time Stanley Cup winner with the Penguins. Patrice Brisebois Montreal Canadiens 1-time Stanley Cup winner with the Canadiens; Jean Béliveau Trophy winner; over 1000 games played. Boyd Devereaux Toronto Maple Leafs 1-time Stanley Cup champion with the Detroit Red Wings. Greg de Vries Nashville Predators 1-time Stanley Cup winner with the Colorado Avalanche. Aaron Downey Detroit Red Wings 1-time Stanley Cup champion with the Red Wings. Sergei Fedorov Washington Capitals 3-time Stanley Cup winner with the Detroit Red Wings; Hart Memorial Trophy winner; Lester B. Pearson Award winner; 2-time Frank J. Selke Trophy winner; Kharlamov Trophy winner; 6-time NHL All Star; over 1200 games played. Bret Hedican Anaheim Ducks 1-time Stanley Cup winner with the Carolina Hurricanes; over 1000 games played. Dan Hinote St. Louis Blues 1-time Stanley Cup winner with the Colorado Avalanche. Bobby Holik New Jersey Devils 2-time Stanley Cup winner with the Devils; 2-time NHL All Star; over 1300 games played. Curtis Joseph Toronto Maple Leafs King Clancy Memorial Trophy winner; 3-time NHL All-Star. Frantisek Kaberle Carolina Hurricanes 1-time Stanley Cup winner with the Hurricanes; Olympic bronze medalist. Olaf Kolzig Tampa Bay Lightning King Clancy Memorial Trophy winner; Vezina Trophy winner; 2-time NHL All-Star. Claude Lemieux San Jose Sharks 4-time Stanley Cup winner with the Canadiens, Devils and Avalanche; Conn Smythe Trophy winner; over 1200 games played. Darren McCarty Detroit Red Wings 4-time Stanley Cup champion with the Red Wings, NHL Foundation Player Award winner. Markus Naslund New York Rangers Lester B. Pearson Award winner; 5-time NHL All-Star; over 1100 games played. Teppo Numminen Buffalo Sabres over 1300 games played. Michael Peca Columbus Blue Jackets Olympic gold medalist; 2-time Frank J. Selke Trophy winner. Luke Richardson Ottawa Senators Over 1400 games played. Gary Roberts Tampa Bay Lightning 1-time Stanley Cup winner with the Calgary Flames; Bill Masterton Memorial Trophy winner; 2-time NHL All-Star; over 1200 games played. Jeremy Roenick San Jose Sharks 9-time NHL All-Star; over 1300 games played. Joe Sakic Colorado Avalanche 2-time Stanley Cup winner with the Avalanche; Olympic gold medalist; Conn Smythe Trophy winner; Hart Memorial Trophy winner; Lady Byng Memorial Trophy winner; Lester B. Pearson Award winner; NHL Foundation Player Award; 13-time NHL All-Star; over 1300 games played. Brendan Shanahan New Jersey Devils 3-time Stanley Cup winner with the Detroit Red Wings; Olympic gold medalist; King Clancy Memorial Trophy winner; 8-time NHL All-Star; over 1500 games played. Mike Sillinger New York Islanders over 1000 games played. Jason Smith Ottawa Senators over 1000 games played. Mats Sundin Vancouver Canucks Olympic gold medalist; Mark Messier Leadership Award winner; Viking Award winner; 9-time NHL All-Star; over 1300 games played. Sergei Zubov Dallas Stars 2-time Stanley Cup winner with the New York Rangers and the Stars; Olympic gold medalist; 4-time NHL All-Star; over 1000 games played. Dinger, Ralph, ed. (2009). NHL Official Guide and Record Book 2010. Toronto, Ontario, Canada: Dan Diamond & Associates. ISBN 978-1-894801-16-4. ^ "Board OK's new schedule, Preds sale". ESPN.com. November 30, 2007. Archived from the original on August 14, 2017. Retrieved May 2, 2018. ^ "Habs to host '09 All-Star Game during 100th season". ESPN.com. January 23, 2007. Archived from the original on October 27, 2017. Retrieved May 2, 2018. ^ "404". TSN. Archived from the original on September 9, 2014. Retrieved May 2, 2018. ^ Canadian Press (November 29, 2007). "NHL owners finally approve schedule change; Nashville sale approved". The Hockey News. Archived from the original on April 14, 2009. Retrieved October 11, 2009. ^ "404". TSN. Archived from the original on April 5, 2008. Retrieved May 2, 2018. ^ "Blackhawks, Red Wings meet in the great outdoors". NHL.com. July 16, 2008. Archived from the original on January 18, 2009. Retrieved July 26, 2008. ^ "NHL moves trade deadline back one day". TSN.ca. Archived from the original on October 31, 2008. Retrieved October 28, 2008. ^ "NHL Players' Association urges GM to consider penalizing hits to the head". NHL. March 9, 2009. Archived from the original on March 10, 2009. Retrieved March 12, 2009. ^ "NHL general managers acknowledge economic crisis". NHL. March 11, 2009. Archived from the original on June 4, 2011. Retrieved March 12, 2009. ^ "Rangers receive compensatory pick for Cherepanov". NHL. March 12, 2009. Archived from the original on March 14, 2009. Retrieved March 12, 2009. ^ "News: NHL Calendar – 12/01/2008". nhl.com. December 1, 2008. Archived from the original on December 28, 2010. Retrieved May 22, 2009. ^ "Markus Naslund scores the first goal of the 08/09 season – Canucks Board". Forum.canucks.com. Archived from the original on October 21, 2008. Retrieved October 21, 2008. ^ "Blackhawks fire Savard after four games". TSN.ca. October 16, 2008. Archived from the original on October 19, 2008. Retrieved October 16, 2008. ^ "30 teams, 15 games in 15 cities – One night". NHL.com. October 23, 2008. Archived from the original on May 21, 2011. Retrieved October 23, 2008. ^ "Campoli gives Isles OT win". Globe and Mail. Canada: globesports.com. November 4, 2008. Retrieved November 4, 2008. ^ Gordon, Sean (December 11, 2008). "Tampa takes first step up the mountain". Globe and Mail. Toronto. Retrieved December 16, 2008. ^ "Avery handed six-game suspension by NHL". NHL.com. November 5, 2008. Archived from the original on December 24, 2008. Retrieved December 16, 2008. ^ Shoalts, David (December 23, 2008). "globesports.com: Coyotes' financial situation gets uglier". Globe and Mail. Canada. Retrieved December 24, 2008. ^ Burnside, Scott (December 23, 2008). "ESPN – NHL helping Phoenix Coyotes find investors or new owners because of financial problems". ESPN. Archived from the original on December 24, 2008. Retrieved December 24, 2008. ^ "Struggling Senators fire coach Hartsburg". TSN. February 1, 2009. Archived from the original on May 23, 2011. Retrieved February 17, 2009. ^ "Therrien out as Penguins coach". Pittsburgh Tribune-Review. February 15, 2009. Archived from the original on February 19, 2009. Retrieved February 15, 2009. ^ "Tortorella named Rangers' new head coach". TSN. February 23, 2009. Archived from the original on February 24, 2009. Retrieved February 23, 2009. ^ "NHL.com – Players: Jordan Leopold, Flames – Stats". nhl.com. April 27, 2009. Archived from the original on March 15, 2010. Retrieved April 27, 2009. ^ "2008-09 NHL Skater Statistics - Hockey-Reference.com". Hockey-Reference.com. Archived from the original on July 13, 2017. Retrieved May 2, 2018. ^ "2008-09 NHL Goalie Statistics - Hockey-Reference.com". Hockey-Reference.com. Archived from the original on July 13, 2017. Retrieved May 2, 2018. ^ Shoalts, David (May 14, 2009). "A Season of Contradictions". Globe and Mail. Toronto. Retrieved May 22, 2009. ^ "Title Unknown". Archived from the original on June 7, 2009. Retrieved March 21, 2009. ^ Dinger 2011, p. 157. ^ "Green breaks NHL record in Capitals' win". Globe and Mail. Canada. February 14, 2009. ^ "Radek Bonk calls it a career". nbcsports.com. May 19, 2014. Archived from the original on September 10, 2016. Retrieved May 2, 2018. ^ "Penguins defenceman Boucher announces retirement". TSN. September 3, 2009. Archived from the original on September 6, 2009. Retrieved September 3, 2009. ^ "Brisebois retires a Canadien - CBC Sports". cbc.ca. Archived from the original on March 5, 2017. Retrieved May 2, 2018. ^ "Former Leaf Boyd Devereaux finds new life behind the camera". nationalpost.com. February 17, 2012. Archived from the original on September 30, 2015. Retrieved May 2, 2018. ^ "Where Are They Now?". spectorshockey.net. Archived from the original on October 8, 2016. Retrieved May 2, 2018. ^ "Newly retired Aaron Downey becomes Griffins' unofficial yoga guru". mlive.com. Archived from the original on August 19, 2016. Retrieved May 2, 2018. ^ Jr., Dave Bartkowiak. "Fedorov is in Hall of Fame; time for Red Wings to retire No. 91?". www.clickondetroit.com. Archived from the original on March 7, 2017. Retrieved May 2, 2018. ^ "Hedican retires after 17 NHL seasons - CBC Sports". cbc.ca. Archived from the original on March 13, 2016. Retrieved May 2, 2018. ^ "New Jersey Devils center Bobby Holik decides to retire after 18 seasons". nj.com. Archived from the original on March 13, 2016. Retrieved May 2, 2018. ^ "Goaltender Curtis Joseph retires from NHL". NHL.com. Archived from the original on March 5, 2017. Retrieved May 2, 2018. ^ "Frantisek Kaberle retires after storied career". NHL.com. Archived from the original on September 16, 2016. Retrieved May 2, 2018. ^ "Veteran goalie Olaf Kolzig retires - CBC Sports". cbc.ca. Archived from the original on March 5, 2017. Retrieved May 2, 2018. ^ "News - The Hockey News". thehockeynews.com. Archived from the original on March 13, 2016. Retrieved May 2, 2018. ^ "Longtime Red Wing McCarty announces retirement". December 7, 2009. Archived from the original on December 13, 2009. ^ "NUMMINEN ANNOUNCES RETIREMENT". NHL.com. Archived from the original on March 13, 2016. Retrieved May 2, 2018. ^ "Michael Peca retires after 13 NHL seasons". NHL.com. Archived from the original on September 15, 2017. Retrieved May 2, 2018. ^ "Four Questions with Luke Richardson". NHL.com. Archived from the original on May 2, 2018. Retrieved May 2, 2018. ^ "Gary Roberts retires from NHL - CBC Sports". cbc.ca. Archived from the original on March 5, 2017. Retrieved May 2, 2018. ^ "Emotional Roenick says this time, he was ready". ESPN.com. August 6, 2009. Retrieved May 2, 2018. ^ "Sakic steps away after 20-year career". NHL.com. Archived from the original on March 13, 2016. Retrieved May 2, 2018. ^ "Brendan Shanahan announces retirement". NHL.com. Archived from the original on July 4, 2017. Retrieved May 2, 2018. ^ "Isles' Sillinger announces retirement after 17 seasons". NHL.com. Archived from the original on March 5, 2017. Retrieved May 2, 2018. ^ "Ottawa Names Jason Smith to Coaching Position, Shean Donovan as Consultant". yahoo.com. Archived from the original on March 13, 2016. Retrieved May 2, 2018. ^ "Sundin announces end to brilliant career". NHL.com. Archived from the original on March 9, 2016. Retrieved May 2, 2018. ^ "Report: Former Dallas Star Sergei Zubov Retires". defendingbigd.com. Archived from the original on March 13, 2016. Retrieved May 2, 2018.